I interviewed Gillian Silverthorn, (also known as my mum! ), in February, she is due to run the London Marathon for the sixth time next month. She is raising money for the Leonard Cheshire Disability charity which helps thousands of disabled people in the UK and abroad. If you would like to sponsor Gillian and help out Leonard Cheshire Disability you can do so via her 'Just Giving' page. Emma: Hello Gillian/Mum! Firstly how and why did you first get into running? G: I went to the doctor and explained I was breathless just running up the stairs, he said there’s nothing wrong apart from that I was unfit. I then saw an advert in the paper asking do you want to get fit but hate the gym, I rang the number and the trainer came out made a program of exercises, beginning with the basics- walking and running from lamp post to lamp post, building up slowly. I stuck with this until I did a 6 mile run and found I loved running. E: How many marathons have you done and which has been your favourite? G: I’ve completed the London marathon 5 times and Berlin once. London is my favourite. E: And what is it about the London Marathon that you especially like? 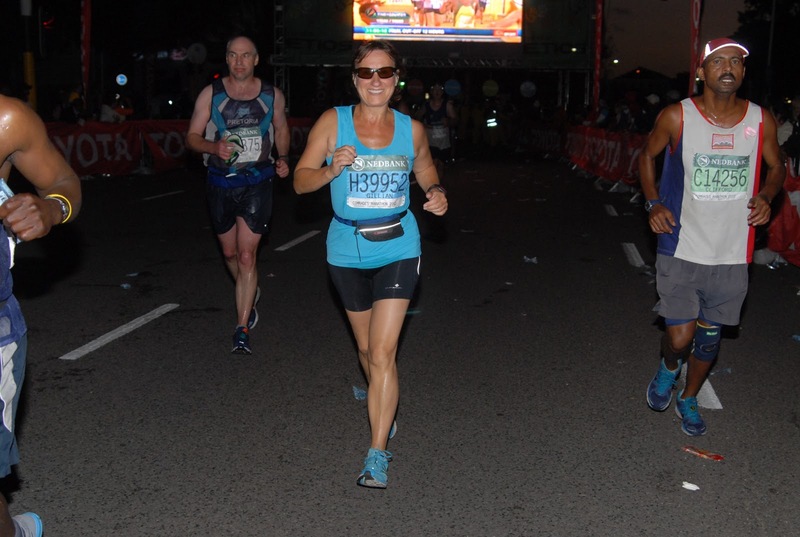 G: For lots of different reasons, it was my first marathon and I’ll always remember the amazing feeling and the sense of achievement when I crossed the finish line, running past all the famous landmarks with the streets packed with people, everyone coming together happy and friendly for one day! E: How long have you been in training for this years’ marathon? 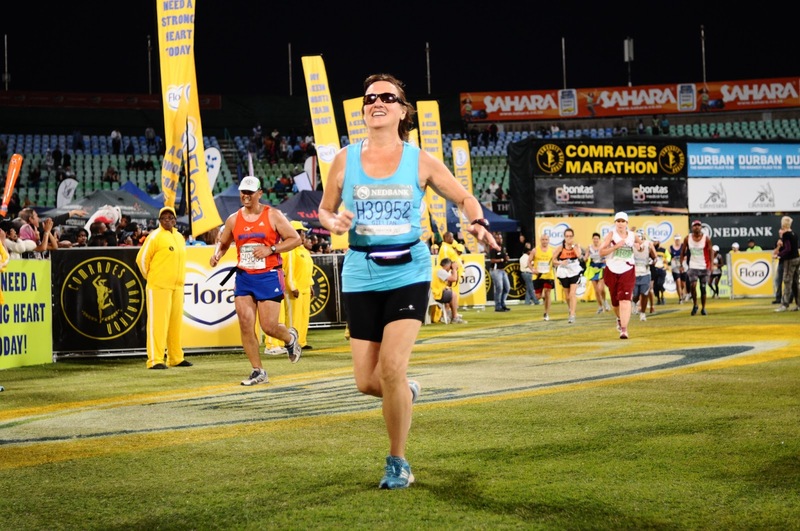 G: For this one I’m only just building back up as I had a break in more than one way, one because I had done the Comrades ultra-marathon in South Africa in June 2012 and thought I would take it a bit easy for a while and I also fell and broke a couple of ribs! E: Why are you running the London Marathon this year in particular? G: I always love to do London if I can but this year I am raising money for Leonard Cheshire Disability. The first Leonard Cheshire home backed on to my childhood home (in Hampshire) and I got to know some of the residents over the years, sadly this home has now closed but it’s a fantastic charity and they are now known worldwide. E: Have you experienced much injury throughout your years of running and training? If so what methods have you used to both prevent and combat injury? G: Yes, in the early days as I tried to build up too quickly, I didn’t warm up or stretch properly so would have pulls and a couple of torn muscles, I have used osteopathy, acupuncture, particularly dry needling and massage in the past all of which all helped with injuries and prevention. At the moment I am seeing a Chiropractor in Cornwall where I live and doing the stretches that she advises in between. I’ve found the treatment of great benefit so far so will continue with the Chiropractic up until race day! E: How do you like to run- alone, with friends, in organised running groups? G: Alone most of the time but have enjoyed runs through the countryside with family and friends. E: Have you ever experienced ‘the wall’? G: Yes a couple of times years ago when I went too fast to early on and ended up feeling like I was running through glue! In recent years I don’t think it has quite been the wall but more like dips and bad patches that usually pass. E: Aside from the physical, what mental effects have you noticed with long distance running? G: On a long run it can be almost meditative. This is the main reason I like to run on my own as I use it as a time to clear my head and put thing in perspective, sometimes what seemed like a huge deal when I set out seems almost insignificant at the end of a run. Just about every problem or worry I have had I manage to sort through on a long run from the most important issues like relationships to the small stuff, even if there isn’t an answer I seem to have a sort of peaceful feeling and acceptance about the things I can’t change. I’ve learnt a lot about myself on my first ultra-run and even though every run isn’t easy I’ve always felt better after a run, and of course if I go out happy I come back even happier. In order to make a deposit you simply add the payment to your monthly mobile phone bill or put extra money into your pay by mobile casinos in order to fund your mobile casino account. Making a deposit through your mobile phone is simple and easy, but there are some disadvantages to this type of deposit method as well.